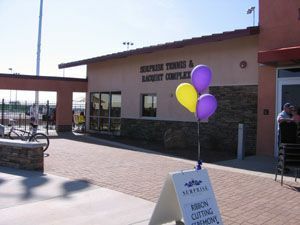 A Ribbon Cutting Ceremony was held on Saturday, September 8 at the new Surprise Tennis & Racquet Complex. Guest speakers included Mayor Joan Shafer, Council Member Joe Johnson, City Manager Jim Rumpeltes and Director of Community & Recreation Services, Mark Coronado. John Austin and Chris Brewer highlighted the new tennis facilities and programs that will be offered at the complex. For a complete listing of all programs call (623)222-2400 or visit the web site at www.surpriseaz.com. Click here for more photos of the ceremony and facilities.